Chicken oil is keto friendly and also helps even those who are not on a keto diet enjoy their sauteed vegetables. Use Chicken Oil to stir-fry your side veggies instead of ordinary oil. Please note that if you are at a risk of high blood pressure and/or high cholesterol, Chicken Oil is not for you. On this page, chicken stock is also produced as a by product. Cut the chicken into pieces if it has not already been cut for you at the meat shop. I recommend hard chicken (hen) because it is tastier than soft (male) chicken hence hen makes a better tasting chicken oil than the rooster. Put it the pieces in a pot and add the seasonings: onions (chopped), thyme and seasoning cubes. If you want to make the purest chicken oil, do not add any seasoning. Feel free to add your own favourite seasonings and herbs for chicken but do not go overboard with those else they overtake the natural delicious flavour of the chicken. Pour water to cover the pieces of chicken and cook till soft. By then you will notice some oil float to the surface. Remove the pieces of chicken and pour the chicke stock/broth into a bowl. Place the bowl in the fridge and once it cools down, the oil will form a cream at the top. Gently scrape the creamy part and place in a glass container. That's the chicken oil. Watch the video below to see how I do that. The liquid left in the bowl is Chicken Stock which you can use to prepare lots of recipes. You can also place the bowl in the freezer. 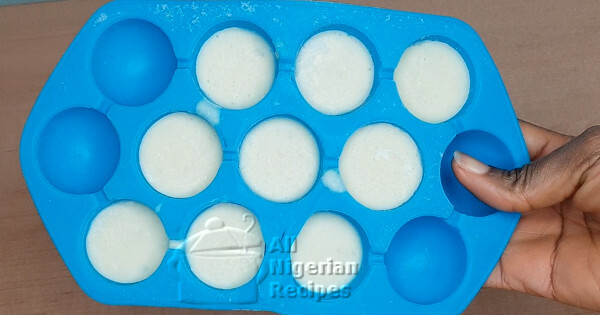 Once everything freezes, bring it out and place on your kitchen counter for a few minutes or till the creamy part is soft while the liquid part is still frozen. The frozen part is Chicken Stock which you can use in many recipes. Store it in the freezer. Scoop the creamy part into a glass container and use as chicken oil. I use chicken oil to stir-fry vegetables and as seasoning. Watch the video below to see how I do that. Also see the recipe: Vegetable Garnish and this Jollof Stuffed Chicken for how I use this Chicken Oil.